I am of the mindset that fresh flowers are always necessary in a home. Not just a silly day like today. There is also no need to spend gobs of money on little lovelies that will soon come to pass. I love the dark contrast of the deep eggplant and the green mixed with the soft pink and ivory. 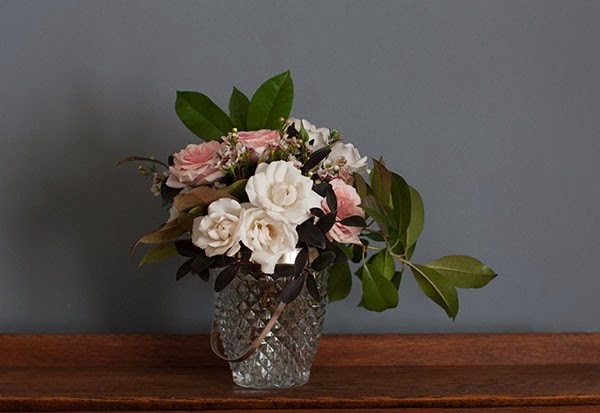 I choose spray roses because they open up beautifully and have a very full and romantic look and I am loving the less put together floral arrangements I am seeing from people like Alice Gao (and friends) and Moon Canyon. And I think my little $5 ice bucket is the perfect vessel. Remember: You can save even more money if you wait a day or two after Valentine's Day...the flower cost drops dramatically. Let me be realistic, so does the chocolate. A good friend of mine has a very wise mother; they have always celebrated together a day or two after so they can get even more fun on a budget! My single ladies out there....This is not a day that should gain great importance. I always made a big deal out of it when I was single and now, as a woman in a marriage that doesn't indulge this "holiday," I realize that it really only means what you want it to mean. 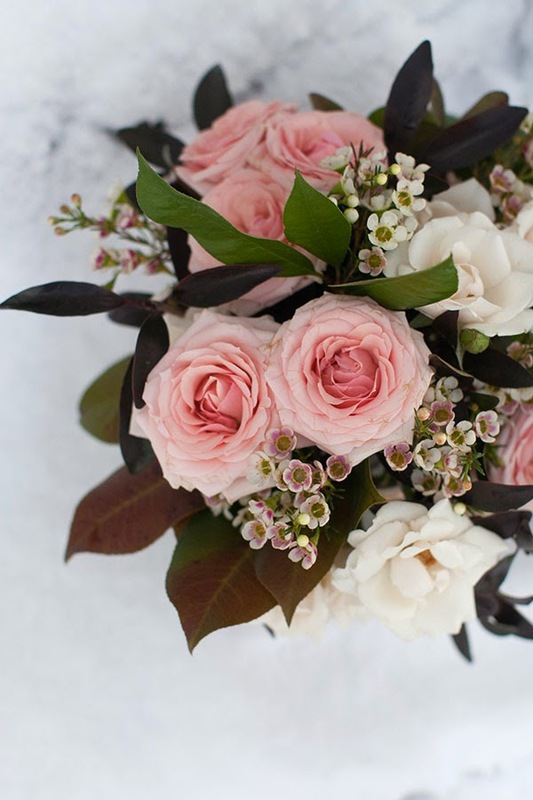 Remind a family member or dear friend how much you love them, go buy yourself some flowers because your home is softer when they are there, and enjoy this wonderful Friday! TGIF!! Flowers in snow...I can't handle the beauty. And I love the touch of red on these green leaves...pulls all of the colors together right nice.